Musjid Near Raj Ghat. Benares. bl.uk > Online Gallery Home	> Online exhibitions	> Asia, Pacific and Africa Collections	> Musjid Near Raj Ghat. Benares. 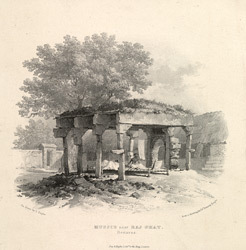 Plate 11 from the third part of James Prinsep's 'Benares Illustrated'. Prinsep (1799-1840), an antiquary and colonial administrator was assay master at the Benares Mint between 1820-30. The lithographs published in this collection were based on his original sketches of the various views of the 'holy' city of the Hindus. Alluding to this plate he writes: 'We commenced our series of views with an emblematical sketch of the changes and resolution which the meditative Hindoo has witnessed and is still witnessing with philosophic unconcern...we conclude it with a type of the feeble and crumbling state to which the most powerful and overwhelming, and so long the most resplendent, of India's exogenous sovereignties has at length dwindled. The sketch was copied from nature in the very court-yard of the residence of one of the Shahzadars or princes of the blood, near Raj Ghat- a grandson of Shah Alum, the last emperor of Delhi...The brick walls and arches which supported the heavy roof of this symbolical edifice have long since mouldered away, a mere external facing of ornamental stone now supports the tottering fabric...'.